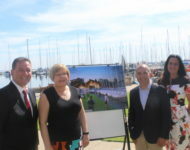 The RGYC auspiced a successful application to the State Government’s ‘Community Harmony Grant’ for Geelong’s ethic communities to build two St Ayles Skiff coastal rowing boats – and was granted the $20,000 to do it. Since then, boat building commenced Deakin University site in their Gheringhap Street Campus. Under the leadership of RGYC members Stuart Dickson, Bill Newman and Peter Spear the team of Geelong’s Syriac community spent Tuesday evenings and Saturday mornings working together to build the first St Ayles Skiff. The finished vessel, “Bride of Bakhdida”, was officially christened and launched by Member for Geelong, Christine Couzens, at the 2018 Wooden Boat Festival of Geelong.